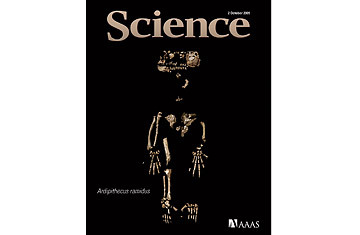 Science magazine with the skeleton of Ardipithecus ramidus, aka "Ardi." Figuring out the story of human origins is like assembling a huge, complicated jigsaw puzzle that has lost most of its pieces. Many will never be found, and those that do turn up are sometimes hard to place. Every so often, though, fossil hunters stumble upon a discovery that fills in a big chunk of the puzzle all at once  and simultaneously reshapes the very picture they thought they were building. The path of just such a discovery began in November 1994 with the unearthing of two pieces of bone from the palm of a hominid hand in the dusty Middle Awash region of Ethiopia. Within weeks, more than 100 additional bone fragments were found during an intensive search-and-reconstruction effort that would go on for the next 15 years and culminate in a key piece of evolutionary evidence revealed this week: the 4.4 millionyearold skeleton of a likely human ancestor known as Ardipithecus ramidus (abbreviated Ar. ramidus). In a series of studies published in the Oct. 2 special issue of Science  11 papers by a total of 47 authors from 10 countries  researchers unveiled Ardi, a 125-piece hominid skeleton that is 1.2 million years older than the celebrated Lucy (Australopithecus afarensis) and by far the oldest one ever found. Tim White of the University of California, Berkeley, a co-leader of the Middle Awash research team that discovered and studied the new fossils, says, "To understand the biology, the parts you really want are the skull and teeth, the pelvis, the limbs and the hands and the feet. And we have all of them." That is the beauty of Ardi  good bones. The completeness of Ardi's remains, as well as the more than 150,000 plant and animal fossils collected from surrounding sediments of the same time period, has generated an unprecedented amount of intelligence about one of our earliest potential forebears. The skeleton allows scientists to compare Ardipithecus directly with Lucy's genus, Australopithecus, its probable descendant. Perhaps most important, Ardi provides clues to what the last common ancestor shared by humans and chimps might have looked like before their lineages diverged about 7 million years ago. Ardi is the earliest and best-documented descendant of that common ancestor. But despite being "so close to the split," says White, the surprising thing is that she bears little resemblance to chimpanzees, our closest living primate relatives. The elusive common ancestor's bones have never been found, but scientists, working from the evidence available  especially analyses of Australopithecus and modern African apes  envisioned Great-Great-Grandpa to have looked most nearly like a knuckle-walking, tree-swinging ape. But "[Ardi is] not chimplike," according to White, which means that the last common ancestor probably wasn't either. "This skeleton flips our understanding of human evolution," says Kent State University anthropologist C. Owen Lovejoy, a member of the Middle Awash team. "It's clear that humans are not merely a slight modification of chimps, despite their genomic similarity." So what does that mean? Based on Ardi's anatomy, it appears that chimpanzees may actually have evolved more than humans  in the scientific sense of having changed more over the past 7 million years or so. That's not to say Ardi was more human-like than chimplike. White describes her as an "interesting mosaic" with certain uniquely human characteristics: bipedalism, for one. Ardi stood 47 in. (120 cm) tall and weighed about 110 lb. (50 kg), making her roughly twice as heavy as Lucy. The structure of Ardi's upper pelvis, leg bones and feet indicates she walked upright on the ground, while still retaining the ability to climb. Her foot had an opposable big toe for grasping tree limbs but lacked the flexibility that apes use to grab and scale tree trunks and vines ("Gorilla and chimp feet are almost like hands," says Lovejoy), nor did it have the arch that allowed Australopithecus and Homo to walk without lurching side to side. Ardi had a dexterous hand, more maneuverable than a chimp's, that made her better at catching things on the ground and carrying things while walking on two legs. Her wrist, hand and shoulder bones show that she wasn't a knuckle walker and didn't spend much time hanging or swinging ape-style in trees. Rather, she moved along branches using a primitive method of palm-walking typical of extinct apes. "[Ardi is] a lovely Darwinian creature," says Penn State paleoanthropologist Alan Walker, who was not involved in the discovery. "It has features that are intermediate between the last common ancestor and australopithecines." See pictures of archaeological discoveries in Afghanistan. See pictures of Charles Darwin's life and discoveries.